Realm Defense is a tower defense game set in medieval-aged a fantasy world. Soldiers are lead by epic Heroes including knights, dragons, wizard, ice queen, and even ancient gods to fight a war against monsters that have wreaked havoc in the Allied kingdoms. Lead these forces in order to gain back control of the kingdom, one level at a time! The game is a pretty good challenge (and entertaining to boot) even for veteran players. It features a huge variety of powers and abilities to help you outlast and beat the different strategically designed waves of enemies in over 100 levels of the game. Pick from the assortment of towers to either deploy rapid-firing archers, carve walls on the map with magic beams, devastate a cluster of enemy mob with cannons, and even summon allies. 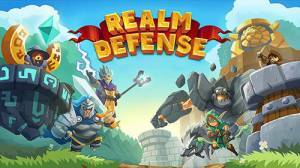 Realm Defense offers variety and challenge. Overcome incredible odds with strategy and wit! Rescue helpless villagers, collect important resources, and recruit legendary Heroes with varied abilities along the way to help you defend the kingdom! Check the table of contents on the right to navigate on our extensive guide for this game! No discussions open for Realm Defense: Hero Legends TD at the moment.